“代沟”means that people of different generations are different in their outlooks on life, their values, and so on, leading to communication difficulties. 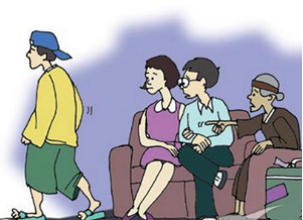 Chinese people usually think that a difference of three years is enough to produce a generation gap. Fùmǔ hé wǒ zhījiān yǒu dàigōu, jīngcháng wúfǎ zhèngcháng gōutōng. There is a generation gap between my parents and me; as a result, we have difficulty in communicating. Wǎnbèi yīnggāi jìnliàng qù míhé yǔ zhǎngbèi jiān de dàigōu. Younger people should try to bridge the gap between themselves and their elders.